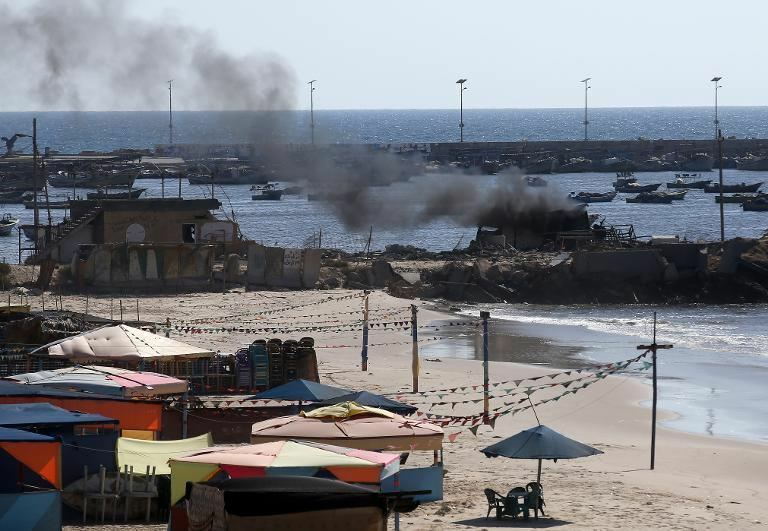 Home Tags Posts tagged with "humanitarian truce"
Israel’s army has begun a ground offensive against Palestinian militants in the Gaza Strip, stepping up its 11-day-old military operation. Troops and tanks were sent into Gaza to deal “a significant blow to Hamas”, Israel said. A Hamas spokesman said Israel would “pay a high price” for its actions. Israel’s PM Benjamin Netanyahu ordered the invasion after days of intensive rocket fire and air strikes between the two sides. Gaza’s health ministry said 11 Palestinians had been killed since the ground offensive began on Thursday night. A five-month-old child was among the dead, Palestinian medics told AFP news agency. Israel said it had killed 14 “terrorists” overnight. Israel meanwhile suffered its first military fatality, with the death of a soldier during the invasion, it said. Some 258 Palestinians – three-quarters of them civilians – have died since the start of the wider Israeli operation on July 8, officials in Gaza say. An Israeli civilian was killed from mortar fire, and several Israelis have been seriously injured, Israeli medics say. It said the goal was to “establish a reality in which Israeli residents can live in safety and security without continuous indiscriminate terror, while striking a significant blow to Hamas’ terror infrastructure”. 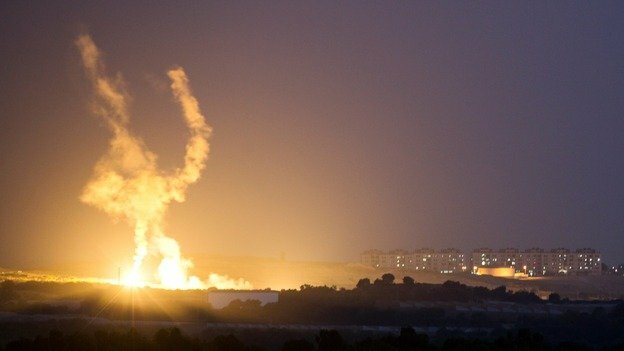 In Gaza City overnight, plumes of black smoke could be seen from the border area where Israeli troops were operating, AP news agency reported. Israel said the initial phase was aimed at targeting tunnels Hamas has dug under the border with Israel to use in attacks. On Wednesday 13 militants infiltrated into Israel through a tunnel aiming to attack a kibbutz, Israeli officials said. The Israeli military said it killed at least one of the militants, while the others are retreated through the tunnel. Reuters news agency said Palestinians reported heavy clashes along the length of the eastern border, as well as in the northern towns of Beit Hanoun and Beit Lahiya. Military spokesman Gen. Moti Almoz warned residents of Gaza to evacuate areas in which the army was operating. “This operation will be extended as much as necessary,” he said. Israel approved the drafting of 18,000 more reservists on Thursday evening, bringing the total of extra troops called up since July 8 to 65,000. Hamas chief Khaled Meshaal said that the Israeli ground operation was “destined to failure”. “What the occupier Israel failed to achieve through its air and sea raids, it will not be able to achieve with a ground offensive,” he said. Palestinian Authority President Mahmoud Abbas said the ground operation would lead to “more bloodshed” and called on Israel to stop. Mahmoud Abbas, whose Fatah party recently agreed to a unity government with Hamas, was meeting Egyptian officials in Cairo amid efforts to negotiate a truce. Israel says it has carried out more than 1,960 attacks on Gaza since July 9, while militants have fired some 1,380 rockets at Israel. It says more than 50 rockets have been fired at Israel since the ground operation began. The ground offensive follows attempts in Cairo to negotiate a new ceasefire. There was a temporary ceasefire on Thursday to allow Palestinians to stock up on supplies and aid workers to distribute water, food and hygiene kits. The truce lasted for five hours, although both sides reported violations. Israel has announced it will observe a “humanitarian ceasefire” in Gaza on July 17, after days of deadly rocket and missile exchanges with militants. A statement from the Israeli military said it would hold fire on Thursday, from 10:00 to 15:00, to allow residents to stock up on supplies. Palestinian officials say Israeli raids have killed 220 Gazans and wounded almost 1,800 since July 8. Hamas militants have fired more than 1,200 rockets, killing one Israeli. The ceasefire had been requested by the UN and other international organizations. But the statement by the Israeli Defense Forces (IDF) added that Israel would respond “firmly and decisively” should the humanitarian window be used by militants “for the purpose of launching attacks against Israeli civilian or military targets”. The move was announced hours after Hamas, the dominant force in Gaza, confirmed that it had rejected an earlier ceasefire proposed by Egypt. Israel initially observed the ceasefire on Tuesday, but resumed its strikes amid continued rocket fire from Gaza. Four children were among those killed in Israeli strikes on Wednesday. They died while playing on a beach near Gaza City. The IDF said they were “carefully investigating” the incident, adding that “based on preliminary results, the target of this strike was Hamas terrorist operatives”. “The reported civilian causalities from this strike are a tragic outcome,” the statement said. Israel launched its Operation Protective Edge on July 8. Its stated objective is to halt Palestinian rocket attacks on Israel, but the UN says most of those killed in Gaza have been civilians. Gaza militants fired dozens of rockets into Israel on Wednesday. Senior Hamas official Sami Abu Zuhri told reporters that the group did not accept Egypt’s ceasefire proposal and that Israel would pay a heavy price for its strikes. Hamas – designated a terrorist organization by Israel and the US, among others – is demanding the easing of border closures in Gaza and the release of Hamas prisoners.